Summer is just around the corner – or is this wishful thinking on my part? At this time of year my thoughts turn to thinking of summer and imagining the warmth and taking time to relax outside. So my attention was rightfully piqued when I saw these beautiful pieces of furniture. I always look for a theme when I am captivated by images, and these pieces have canopies over them, thereby eliminating the need for an umbrella. I like the fact in design that ‘form follows function’ and especially when function can be made inherently beautiful. 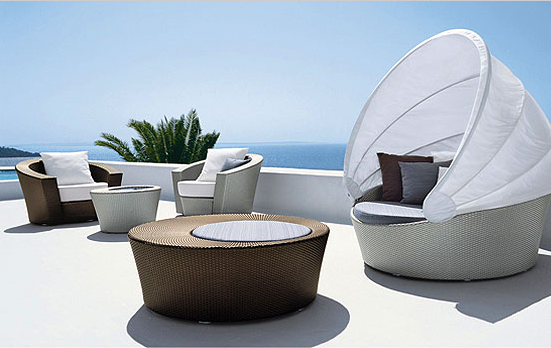 In other words these loungers are self-contained and functionally-integrated escapes from the sun. I can just imagine sitting in the warmth in these beautifully designed and functionally-integrated pieces of furniture. What about you? Are you dreaming about summer? WHAT'S HOT in the world of interior design, architecture, lifestyle, and travel. i am dreaming of whistler. I am dreaming of summer too...wouldn't it be amazing to sit in that Dedon chair, a drink in one hand, a design magazine in the other?...ahhhh rain please go away! Mmmmmm Patricia right where I would love to be with a good book and glass of bubbly! Dedon makes the most beautiful outdoor furniture whenever it is needed and the budget allows I use their pieces. Those daydreams-daybeds are so inviting and romantic, of course the scenery helps dreaming even to spend a night under the stars with the sweet sounds of the sea. Love the dreams where would we be without them and the great results that come from them. Love it I''m thinking Greece right about mid-summer. OMG how i long for warm weather. The rain here in Vancouver is getting me down. Dedon furniture right now is heaven! Since I live in Brasil and we have a very long and hot summer, I can't wait for Winter. But these Dedon chairs and lounges are fantastic. Wish I had the weather for one of those daydream beds. The Dedon owner was a neighbor of ours > he have a summer house on Ibiza and the photos they make in 2 different houses of 'friends' of my in Es Cubells area. I miss Ibiza sooo much...! Great ideas of summer lounger. Love it. Summer is Fun and it is almost here. Love this captured photos of yours and we need these to add up to our summer designs in school. Great stuff many thanks for sharing. Thanks for the interesting post! I've really enjoyed the information that has been shown throughout the text in addition to the images that showed. For us of us who are dedicated to the architecture and design we love share and communicate our work with groups and people who have this passion in common. Thanks again for such wonderful post! I imagine myself sitting under one of those canopies all curled up reading a book and listening to the sound of the ocean! Is that to much to ask? Thanks for the inspiration!